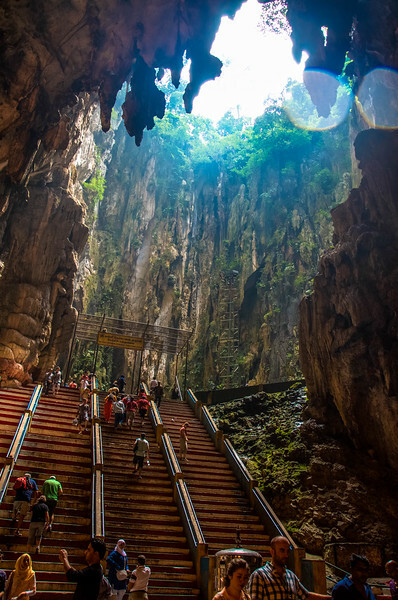 It was somewhere around perhaps the 100th out of 272 calf-obliterating steps leading upward into the jagged gaping mouth of Kuala Lumpur’s Batu Caves that I glimpsed a flash of something brown and hairy torpedoing toward my face. Gasping, I jerked away from the dark blur whipping past atop the painted cement hand rail I was using to haul myself upward. 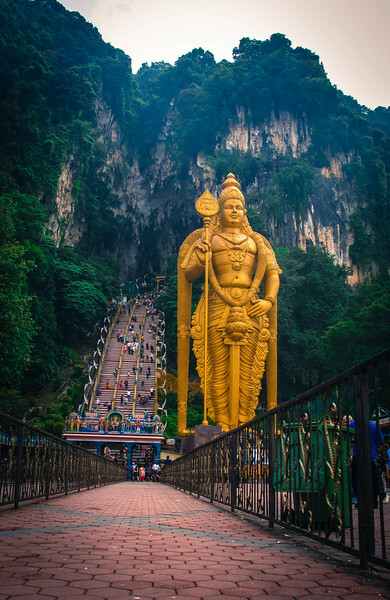 The yellow hue of the handrail coordinated nicely with a 140 ft. golden statue of Murugan, Hindu god of war, positioned near the stairway entrance. 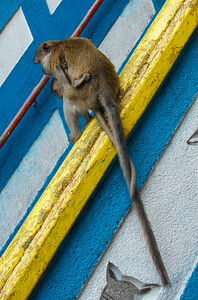 The hurtling furry blob turned out to be a mother macaque, her big-eyed baby clinging to her underside. I suddenly noticed an abundance of monkeys skittering across this jungle of human legs and cameras. Each was playing a game of ‘tourist roulette,’ approaching anyone with a purse or backpack, hoping to score a tasty handout. Their strategy worked at least some of the time. 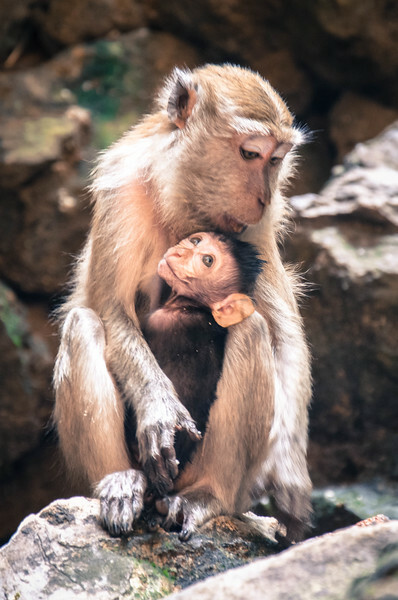 I watched in mild disbelief as a group of five giggling Chinese tourists brandished a banana from one of their bags — a young woman wearing an I ❤ NY t-shirt peeled the top of the banana and held it out to a small macaque, trying to lure it close enough to pet. It didn’t go well, of course. The monkey let out a piercing screech, snatched the banana from her hand, and chattering wildly, fled up the stairs to relative safety with his prize. I continued on into the main cave, which expanded like a great cathedral. 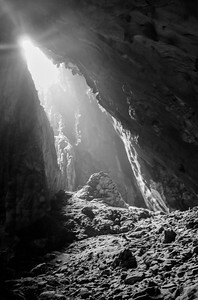 Its ceiling of dark stalactites was so high it nearly escaped the reach of daylight. On the opposite end, a second opening like an Indiana Jones movie set beckoned me forward. I ascended another set of stairs to the vivid-hued temple of Murugana. Lazy beams of dusty particles drifted to the ground through a natural, tree-rimmed skylight. 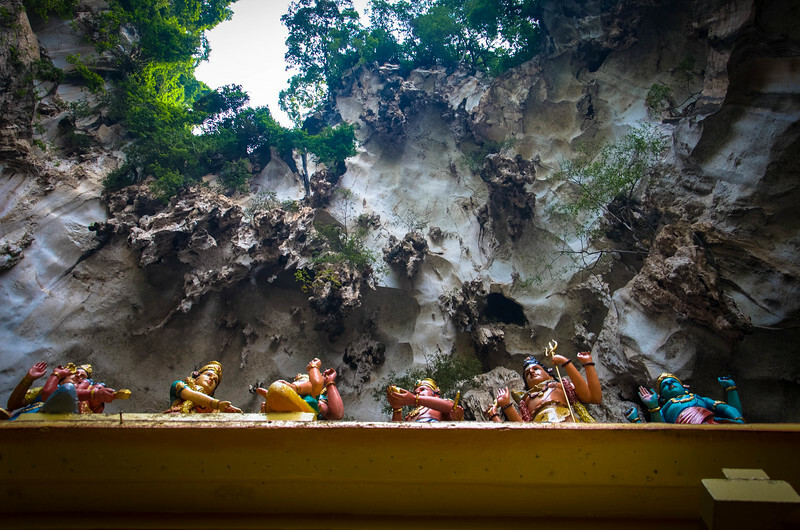 The drone of human noise that had inundated the air at the entrance to Batu Caves fell away here. It seemed even the monkeys observed a certain quiet reverence. I lingered, gazing in awe at the 400 million-year old cave walls and felt peacefulness settle inside me. It was a welcome feeling. Only temporary, I knew, but I sponged it up anyway; into my pores, into my bloodstream. 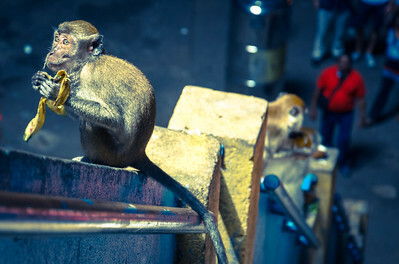 I tried to keep it there, that addictive sense of calm and happiness, as I eventually merged again into the crowds and monkeys and mayhem, out toward the stuff-hawkers and persistent taxi drivers. But my simmering annoyance was quickly replaced with a new source of happiness — located literally right around the next corner, at the Dark Caves. 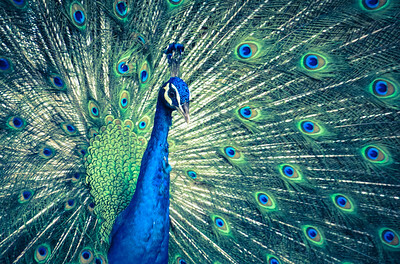 A fascinating cave tour was followed by a visit to a truly impressive bird sanctuary. My happiness levels soared again. September marks my SIXTH MONTH of travel!!! It began amid the maddening chaos of Hanoi, Vietnam, where I boarded a bus to check out the incredible rock islands of Halong Bay on the northeastern coast. After a few days there, I beelined in the opposite direction to Sapa in the northwestern mountain region to embark on an extremely tough 3-day trek into Muong Hoa Valley. Following that, I was more than ready to head to Kuala Lumpur, the uber modern capitol of Malaysia, for two and a half weeks of R&R, housesitting at a beautiful condo. 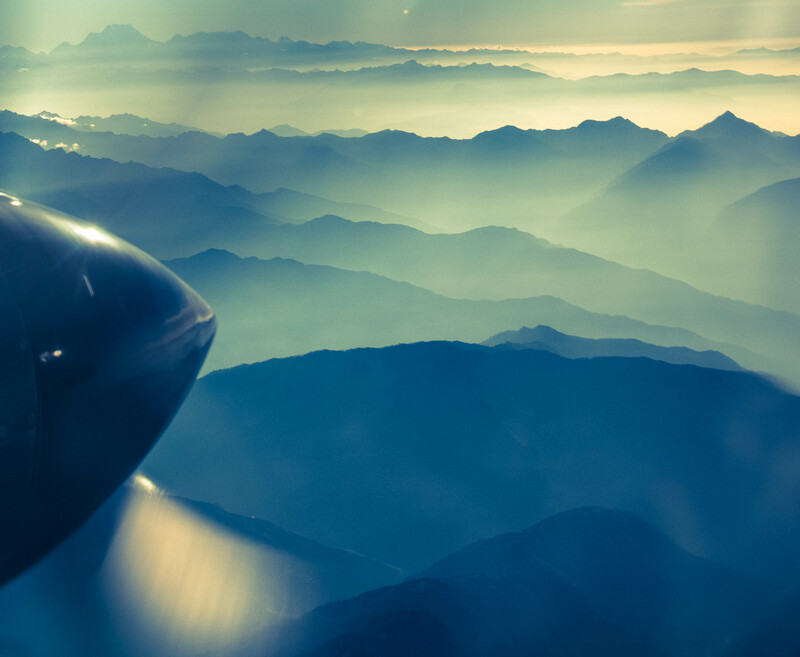 Finally, I flew to Kathmandu, Nepal, which I kicked off with an airplane tour of the Nepalese Himalayas, including Mt. Everest. This month has actually felt a lot like a turbulent airplane ride. I’ve bounced between ups and downs that at times have made my head spin; hopping between absolute happiness and varying levels of dissatisfaction. In a way, it’s kind of appropriate because Asia itself is a land of enormous gaps: Between wealth and poverty; comfort and the barest life basics; big city craziness and traditional rural simplicity. My experience in Vietnam snapped me back and forth like a rag doll between those elated highs and awful lows. The hot, hectic big cities overwhelmed me and made me want to hide away in my hotel rooms. The gilded rice terrace views of Sapa filled me with warm gratitude. 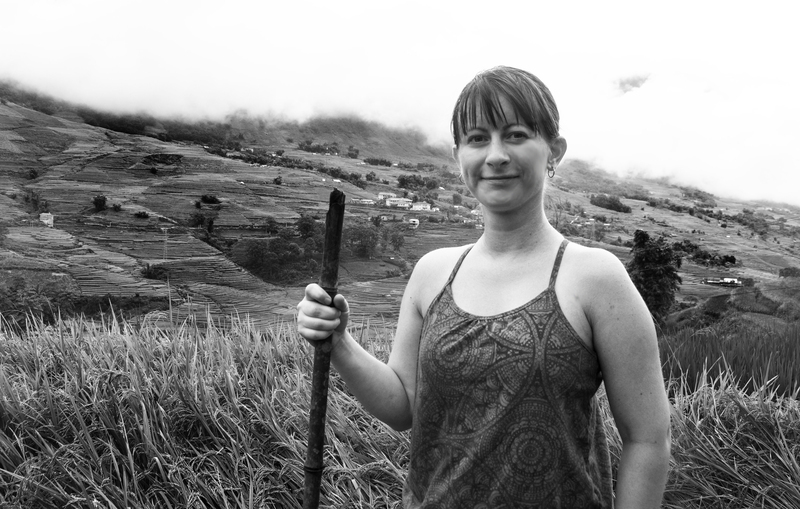 But it was agony dragging myself up and down mud-slicked mountains in the intense humidity, trailing embarrassingly far behind my companions, seriously doubting whether I was physically capable of completing the trek. Though when I finally finished the trek, it felt amazing. During my stay at the housesit in Kuala Lumpur, I felt like weeping from the sheer joy of having things I always took for granted back home: A comfortable bed, air conditioning, strong wifi signal, a couch and a TV with channels in English, a fully-equipped kitchen with a working refrigerator AND freezer, a clean shower with reliable hot water, washer and dryer, dishwasher — the works. 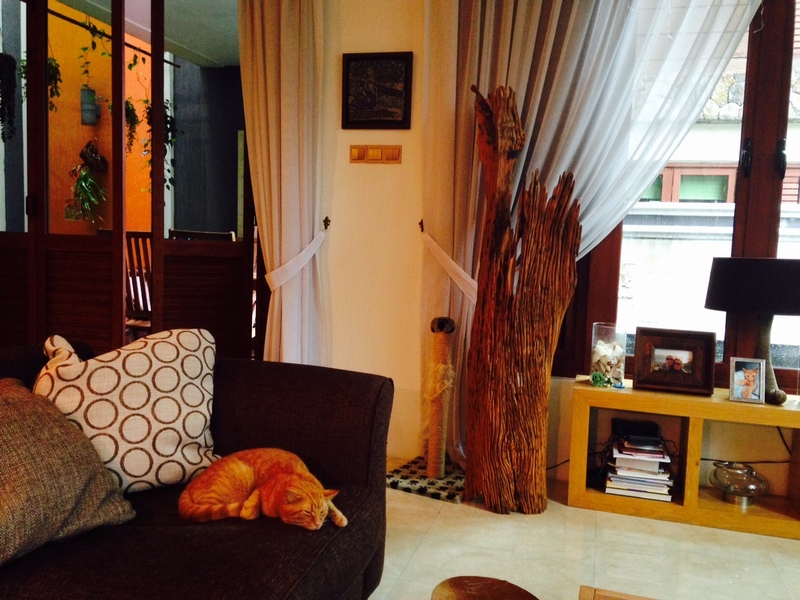 Plus, a private swimming pool, a koi fish pond, and two adorable cats for company. It was a magical dreamland. Unicorns and fairy dust and fields of flowers and peacefulness. I never wanted it to end. When it did inevitably come to an end, and I landed in sprawling, loud, chaotic Kathmandu, Nepal where few of those luxuries existed — it was a big shock. That first evening, I sat sweating, hungry and uncomfortable on my cement slab of a bed in my sweltering fan-less, wifi-less Airbnb room. 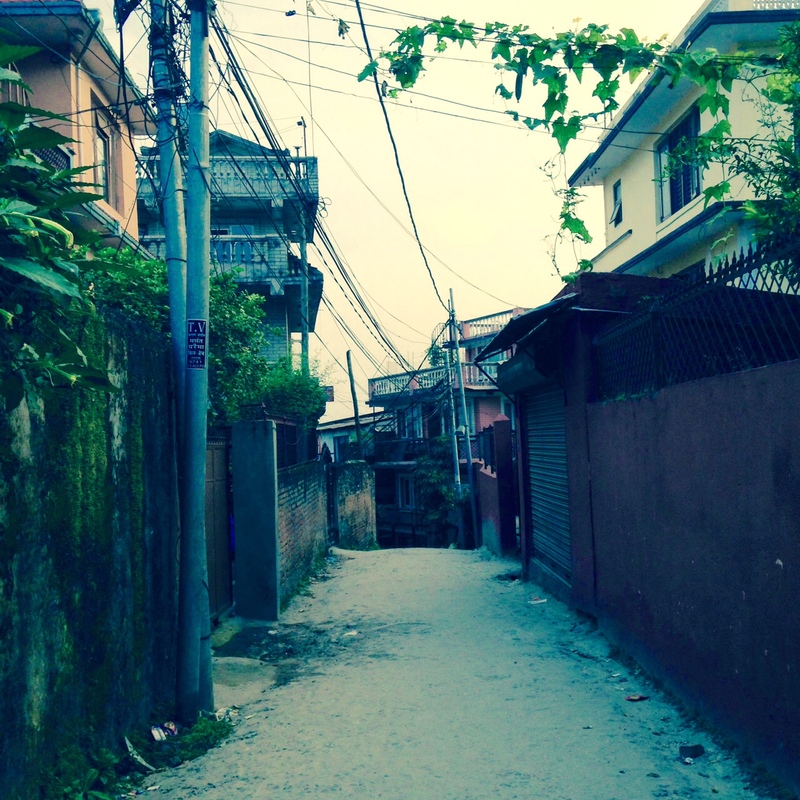 And aside from the confusing web of nameless, dust-choked streets and colorful but dilapidated houses surrounding my homestay… I was close to absolutely nothing. I had signed up for two whole weeks of this in a city that did not really charm me. I was miserable. And bitter. And wanted to get the hell out of Kathmandu. Then I felt guilty and snobbish for my discomfort when this place was actually pretty nice digs as far as lodging goes in Nepal. Plus, its low cost was doing wonders for my budget. I figured I ought to accept and adapt, and try to make the best of things. After all, it could always be worse. Three days of little sleep, two cold showers, and a flight around Mt. Everest later, I decided that I had given the situation and the city a fair chance. It wasn’t for me; it was time to move on. It’s taken six months of travel to really start realizing that none of my plans are written in stone. This is my journey and my life, and if I’m not happy, there is no reason I can’t make a change. I can go find the happiness elsewhere. Even if I have to run a gauntlet of stairs, tourists, and banana-stealing monkeys to discover it. 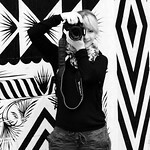 Stay tuned for upcoming stories and photographs of Mt. Everest, Chitwan National Park and lovely Pokhara, Nepal! I admire your courage for making your journey…….